That we’d had something of an extreme monsoon is perhaps an understatement of sorts. The rains have been drastic this year, and the effect has been visible in many parts of the country, especially with the havoc caused in Coorg and Kerala. Now, I’m not saying that the Delhi-NCR region has received anywhere near the quantum of the rainfall of the two mentioned regions, but whatever we’ve received has highlighted something that’s at a perpetual state of underdevelopment in our country – the infrastructure. Every time there’s a heavy spell of rain – and God forbid it happens early morning – the roads to work become waterlogged and the resulting traffic madness can be quite mind numbing. In fact, for the first time in many years I managed to miss a flight this month, mainly because the commute from my house to the airport – which normally takes 75 mins – took close to 2.5 hours. The saving grace, once again, on my daily commute though has been the water wading and rough road capabilities of the Jeep Compass. 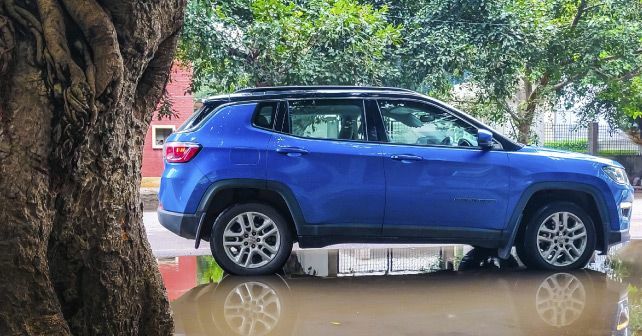 Where most other sedan, hatchback and even SUV drivers shrink from driving over waterlogged roads, the Compass just flows through. And with its fantastic ground clearance and great suspension setup, it remains a truly stress-free daily driver for me.